Free Shipping Included! 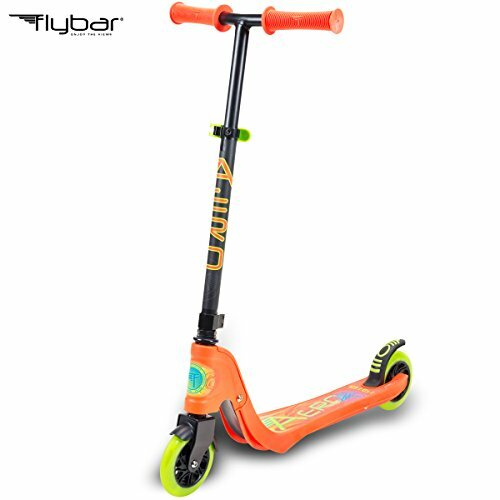 Flybar Aero 2-Wheel Kick Scooter For Kids With Grip Tape Deck, ABEC 5 Bearings, 125mm Light Up Wheels & Adjustable Handlebars - Holds Weights Up To 175 Lbs by Flybar at Angelos Hobbies. MPN: FBASCOT-O. Hurry! Limited time offer. Offer valid only while supplies last. QUALITY KIDS SCOOTER: The Aero Scooter is the new smooth riding, thrill seeking 2 wheel scooter from Flybar. Ride in style with light up wheels and colorful designs. Made of durable materials that is built to make the fun last! DURABLE STEEL FRAME & ADJUSTABLE HANDLEBARS: The Aero Scooter is built to last with its full steel frame and steel supported composite deck. Not only are the handlebars adjustable for small and larger children, the handlebars also feature custom Flybar hand grips that are comfortable and safe when riding. Two adjustable height settings from 27.5" to 32". GRIP TAPE COVERED DECK WITH COOL DESIGNS: The Aero 2- Wheeled Scooter features a grip tape covered deck for maximum stability and control while scootering but also gives the scooter a cool and unique look unlike any other scooter out there! Aero Scooters come in 3 different colors; blue, orange, and pink. Each featuring its own unique grip tape design. EASY TO USE REAR BRAKE WITH LIGHT UP WHEELS: The Aero 2 wheeled scooter features a large, steel rear foot brake for a quick, safe and easy stop. Both wheels also light up while you are riding! LARGE 125MM WHEELS WITH ABEC 5 BEARINGS: Ride fast and smoothly with our large 125mm PU wheels and quality ABEC 5 bearings. If you have any questions about this product by Flybar, contact us by completing and submitting the form below. If you are looking for a specif part number, please include it with your message.